Who doesn’t love books that speak to us where we are in life? 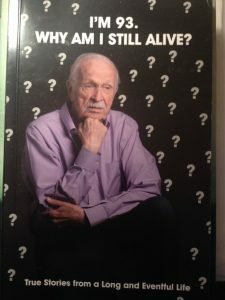 Whether you’re feeling old or caring for aging parents, or you’re just curious or wanting to read a good memoir/story, here are a few – in a wide range of topics – from the year 2016 that some of us Boomers might enjoy. Light reading that may appeal to several different levels of curiosity. My reaction to a few of the statements was to go and check another source before believing it, so keep your truth detector in gear and tell kids to double-check with you if they question something. Suitable for adults and kids maybe 7 and up. My 9-year-old granddaughter found it intriguing in small doses. Available on Amazon in hard cover and Kindle editions, both ~$12. Bourbon: The Rise, Fall and Rebirth of an American Whiskey, by Fred Minnick. The author is famous for writing about spirits in a well-researched and entertaining fashion. This book is no different – amusing anecdotes, interesting history of the spirit as unique to its original home in the South, fascinating stories of competition between distillers, and even a story of how James Bond, who ordered a martini “shaken, not stirred” instigated the rise of white spirits to compete with bourbon. Sample chapter headings include: “Government: Friend and Foe,” “Whiskey Is the Devil’s Own Brew,” “Distillers vs. Nazis and US Government,” “To Beat Jack Daniel’s” and more. The books’ bibliography reveals how the author conducted his research: interviews with important industry figures, government publications, books, corporate literature and so on. Quarto Publishing Group 2016. ~$12 Kindle edition, ~$15 hard cover on Amazon. Move to France at 78? 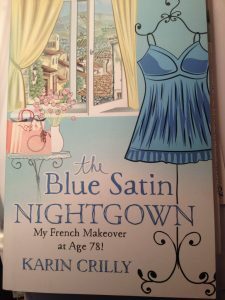 The Blue Nightgown: My French Makeover at Age 78!, by Karin Crilly. It’s a memoir, not a novel. The author’s husband of many years dies after a long illness, and she decides to move to Aix-en-Provence to fulfill a lifelong dream of living in France, despite the fact she doesn’t speak the language. Simply written, the story is a chronicle of her experiences there in search of joy, learning and, yes, romance at age 78. She re-connects with a guy she met 25 years earlier and, after months of increasingly intimate phone conversations, agrees to meet him in Amsterdam – and buys a blue satin nightgown in anticipation. You have to read the book to know what happens. This is an easy read, a charmingly simple story of a huge adventure undertaken by a long-past Boomer-age woman of comfortable means. And it’s even more enjoyable because she ends each chapter with a recipe for something wonderfully French to eat. $6 Kindle. 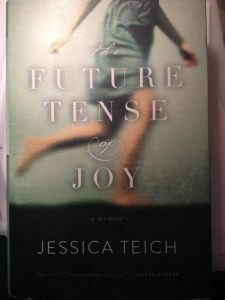 The Future Tense of Joy: A memoir, by Jessica Teich. This book is the beautifully written chronicle of a brilliant 30-something woman’s battle with childhood demons and a seemingly ineradicable fear about life’s danger. Educated at Yale and then at Oxford as a Rhodes scholar, she has two young girls and a loving husband, but she can’t get control of her fear. One day she hears about another brilliant young woman, also a Rhodes scholar, who at age 27, had a hugely promising life ahead of her – but chose instead to commit suicide. Author Teich decides she will investigate this woman’s life story and see if, in deciphering that woman’s suffering and life choices, she can find help for her own struggles. The story is full of tension and drama and even some of the really tough parts read almost like a novel in gentle poetic prose. $14.99 Kindle on Amazon.